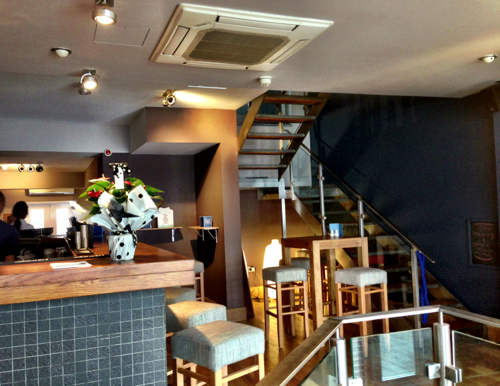 We popped into the Blue Dog Bar, Ashley Road, Altrincham to try one of the local new eateries. The interior is clean, welcoming and comfortable. It’s also the perfect place for a business meeting or even a quick drink – whether making a night of it, or just have a social drink after work. If I was being picky, I would say that Eggs Benedict is in fact the spinach-free version – as the spinach version is actually called Eggs Florentine! After quite a long wait, it arrived – and it was time to see whether I have found someone to replace Eat Cafe’s legendary Eggs Benedict…. I enjoyed the Eggs Benedict. 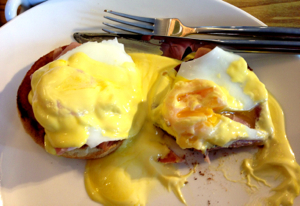 The hollandaise sauce was beautiful, smooth and rich. However, I am afraid it cannot equal that elusive ‘best, five star’ mark. 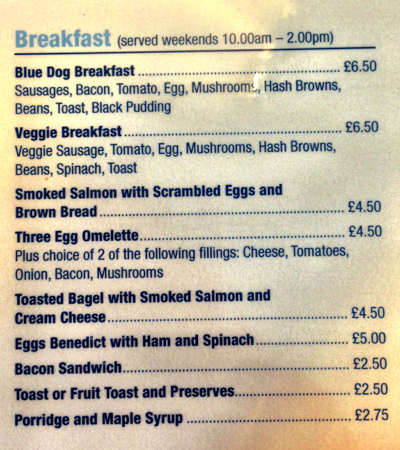 But, for all accounts it is a pretty good Eggs Benedict. But it was good enough for me to be disappointed when I had eaten half of it, and it was time to exchange with my friend, as we’d agreed to do ‘half and half’. I was tempted to go back on my world and carry on eating. But I did the right thing and swapped half of my Eggs Benedict for half of the Fishfinger sandwich and chips. The fishfinger sandwich wasn’t as good as the Eggs Benedict, so I should have hung onto my plate! 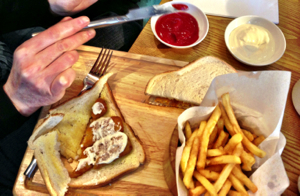 I think though, and if they served it on nicer bread, and perhaps had an option for chunky chips instead of skinny fries (or maybe that was on the menu, but we hadn’t selected it), it would have been better. So, the verdict? The whole visit was a pleasant, friendly experience and the waitresses were often checking to see whether all was okay. Service was a little slow, but that could be because they’re still new and the staff were still learning the ropes. I shall return in a few weeks and see whether the initial teething problems have ironed out. But I like the place, I liked the people and I want them to succeed. I would like to pop in one evening, as I am sure it would be a good venue to meet up for a few drinks and some nibbles. Something else worth a mention, is that they have excellent toilets. I love it when restaurants/bars have great toilets – clean, fresh and offering Molton Brown soap and hand-wash. Brilliant. In the meantime, I am looking forward to their wifi being up and running – as I would like to use it as a business meeting venue or someone to go and work when the walls are closing in on me at home – because it doesn’t strike me as a place where I would have to compete with the buggy brigade. And of course, looking forward to sitting outside when the sun returns.